It was the moment two billion people held their breath. 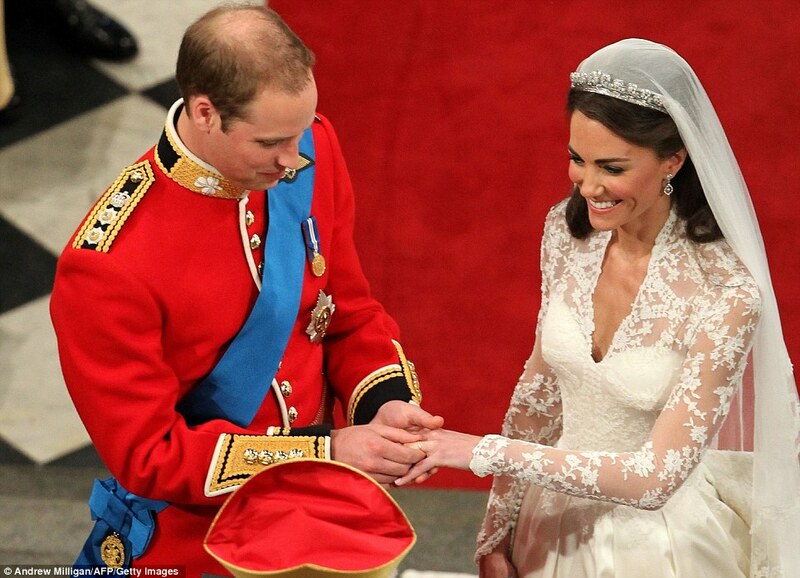 As William put the ring on his bride's finger in Westminster Abbey, for just a second, it looked like it wouldn't fit. 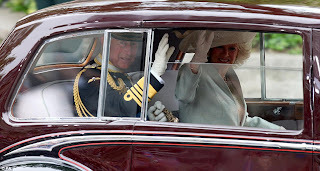 But the prince managed to stay cool in a tight spot, no doubt helped by his time at Sandhurst, and struggled the simple gold band into place. 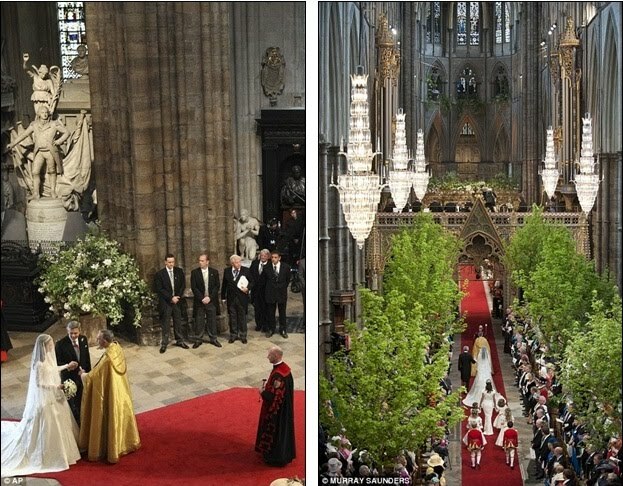 It was the only tense moment of a spectacular fairytale ceremony inside Westminster Abbey. The future king and his bride, who will now one day be queen, pledged their love for one another in the ancient surroundings, watched by two billion across the globe. 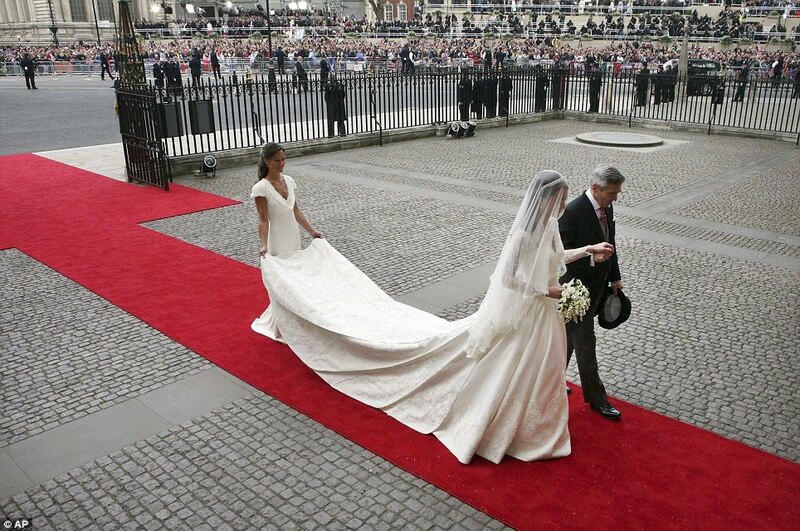 The Rolls-Royce carrying the bride arrived Westminster Abbey at 11am as the church bells rang out. When her father took her left hand they began their procession along the red carpet that started outside the ancient building and led inside, with her sister Pippa carrying her train. The Dean of Westminster greeted the bride and her father and the pair paused as final adjustments were made to the dress before the procession began. 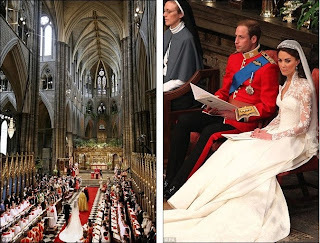 As her young bridesmaids and pageboys assembled behind her in the nave, beneath the impressive 18th-century stained glass West Window, Miss Middleton was able to take in the abbey's shimmering Waterford crystal chandeliers and vast gothic arches above her. 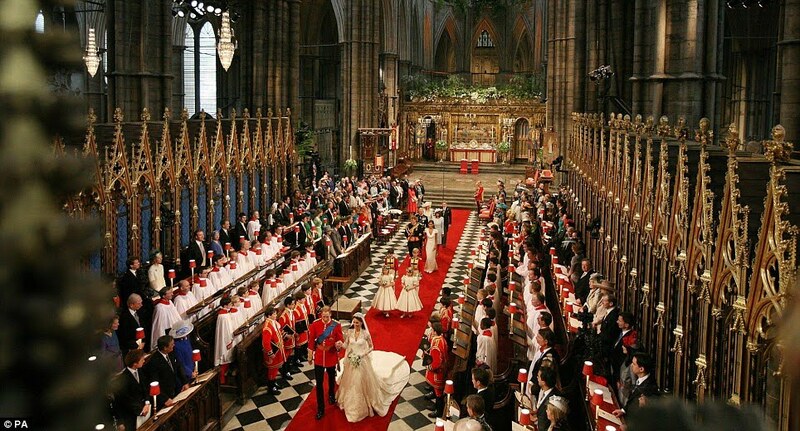 On her father's arm, Kate walked up the aisle as a commoner to the sounds of the coronation anthem, Parry's 'I Was Glad'. 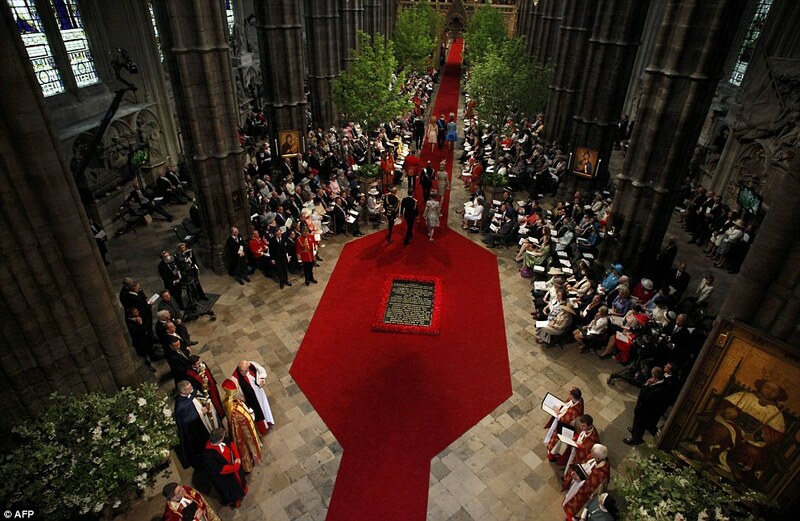 As her groom waited, Kate moved along the red carpet, around the south side of the poppy-lined Grave of the Unknown Warrior - the only gravestone in the abbey over which it is not permitted to walk. 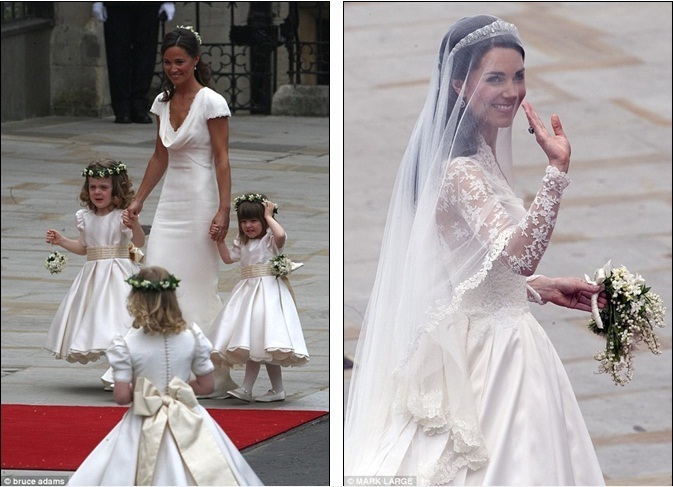 Behind her was her maid of honour and sister charmingly holding hands with the youngest of the bridesmaids Eliza Lopes and Grace van Cutsem - both just three-years-old. 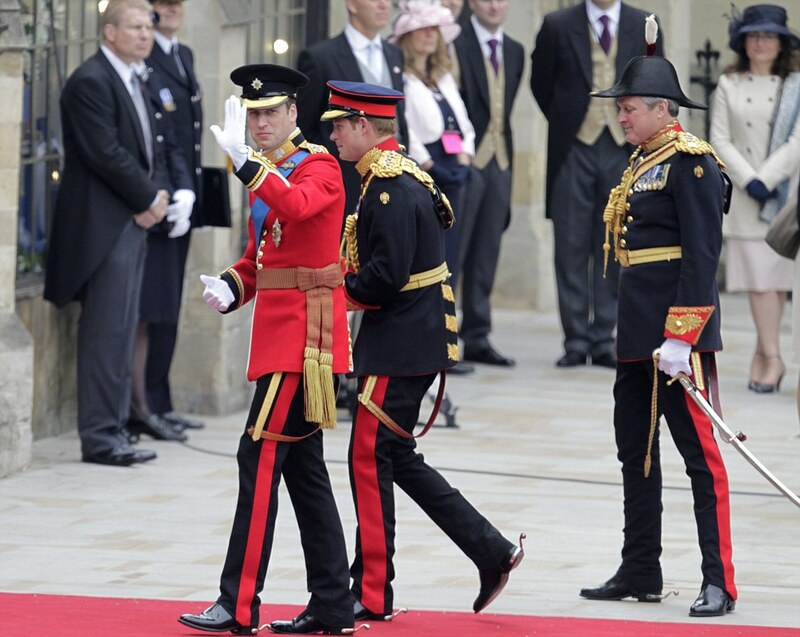 They were followed by Lady Louise Windsor and the Hon Margarita Armstrong-Jones, and then the page boys Tom Pettifer and Billy Lowther-Pinkerton. 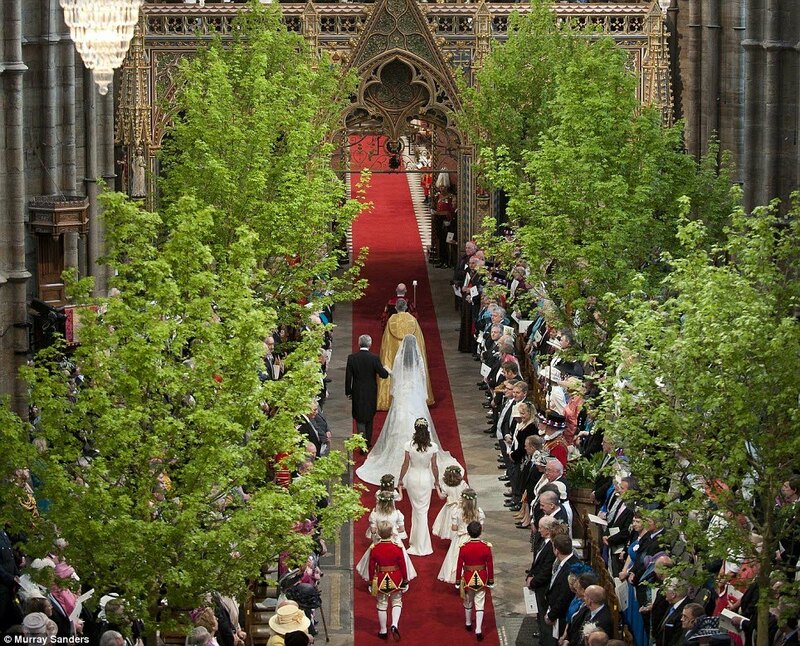 Walking through the 'avenue of trees', Kate processed past delighted guests seated facing inwards in the nave before moving through the intricate golden quire screen, on top of which sit the orchestra, and into the quire. 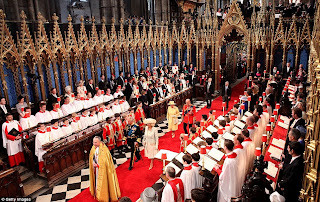 In the Victorian gothic wooden stalls lined with red lamps, sat Prime Minister David Cameron and other senior politicians and high commissioners, as well as the two choirs and their schoolboy choristers. 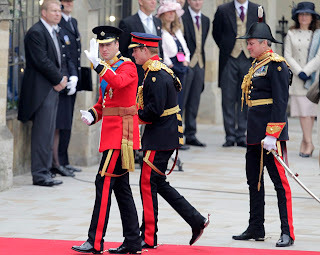 Here, Miss Middleton made her way to the Lantern, where she finally met William, resplendent in his dashing red Irish Guards uniform, at the Sacrarium steps. 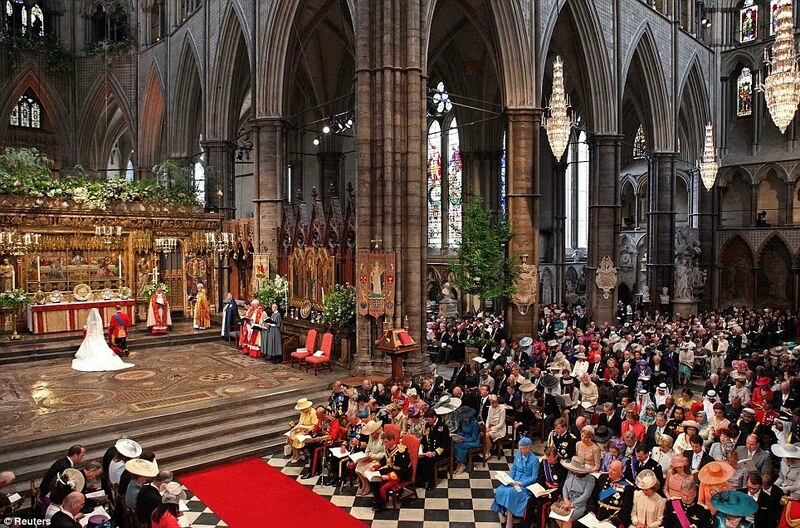 In the south transept stood William's grandparents the Queen and the Duke of Edinburgh, his father the Prince of Wales and stepmother the Duchess of Cornwall, and other members of the Royal Family. 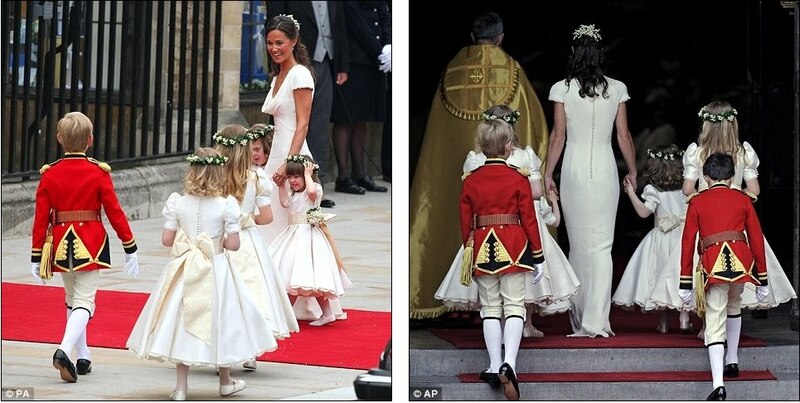 In the north transept were the Middletons and many of William and Kate's close friends. 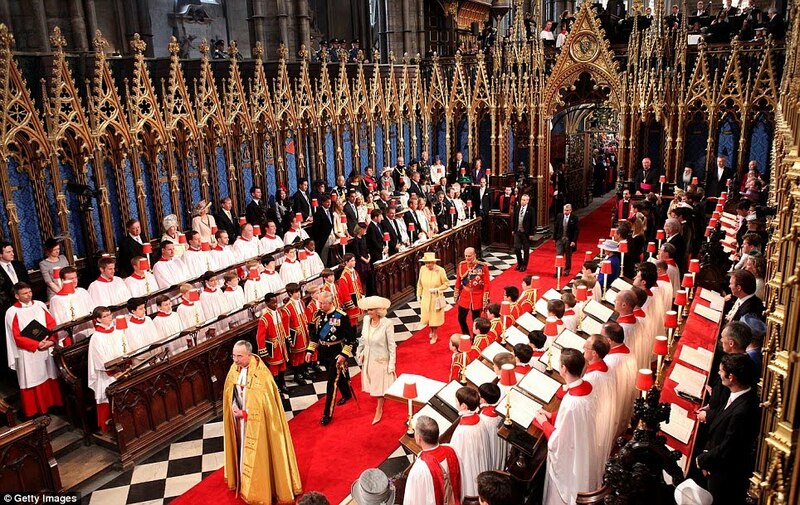 The first hymn, Guide Me, O Thou Great Redeemer, rose high into the nave as the choirs of the abbey and Her Majesty's Chapel Royal, St James's, led the congregation in singing. 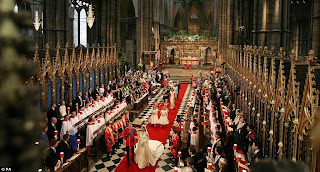 Before beginning the marriage ceremony, the Archbishop asked the couple if there was any reason why they could not wed. The only two acceptable reasons would be if couple were too closely related or if either were already married. 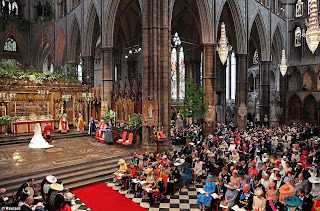 William spoke in public for the first time today when he replied 'I will' in a clear and strong voice to the Archbishop of Canterbury's question about whether he would 'love, comfort, honour and keep' Kate. 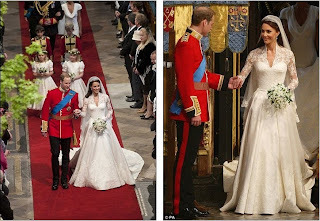 His bride spoke more softly when she said 'I will' in response to the same question. 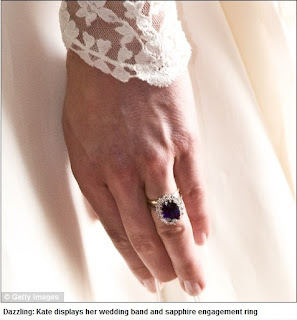 Kate looked nervous and at several points appeared slightly choked with emotion as she repeated her vows in front of the large congregation. 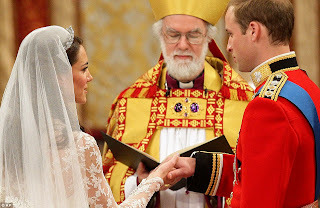 In his address, the Bishop of London, the Rt Rev Richard Chartres, read a prayer penned by William and Kate. 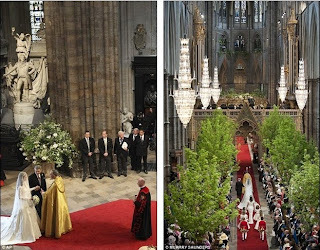 The newlyweds asked for spiritual help to maintain focus on the things that mattered, and to be "generous" with their "time and love and energy". 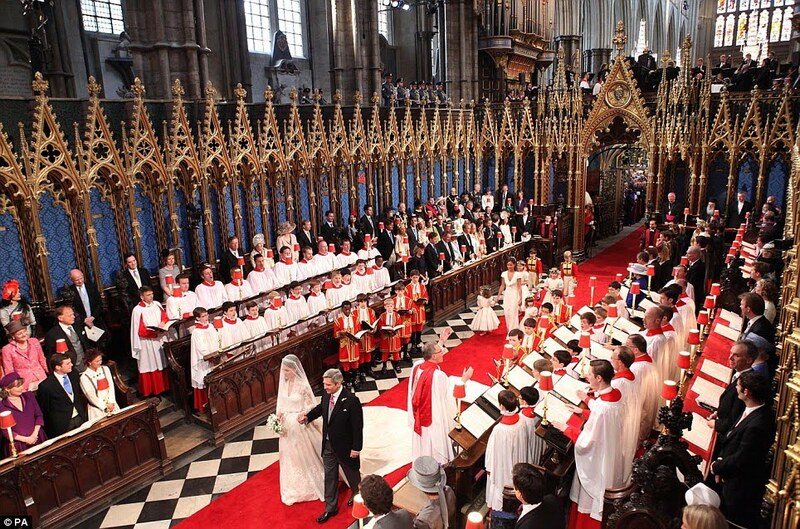 They also called on God to help them 'serve and comfort those who suffer' - a declaration of intent for their new life together. The bishop, who has close links to the groom and his family, told the congregation: "I pray that everyone present and the many millions watching this ceremony and sharing in your joy today will do everything in their power to support and uphold you in your new life. 'I pray that God will bless you in the way of life you have chosen, a way which is expressed in the prayer that you have written together in preparation for this day. 'God our Father, we thank you for our families; for the love that we share and for the joy of our marriage. 'In the busyness of each day keep our eyes fixed on what is real and important in life and help us to be generous with our time and love and energy. 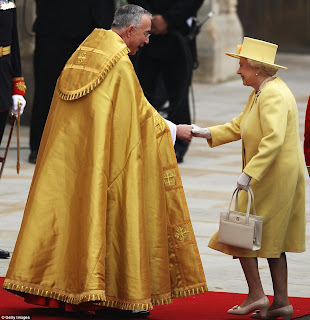 'Strengthened by our union, help us to serve and comfort those who suffer. We ask this in the Spirit of Jesus Christ. Amen'." The couple and their immediate family enjoyed their only private moment of the service when they retired to the abbey's holiest area to sign the registers. 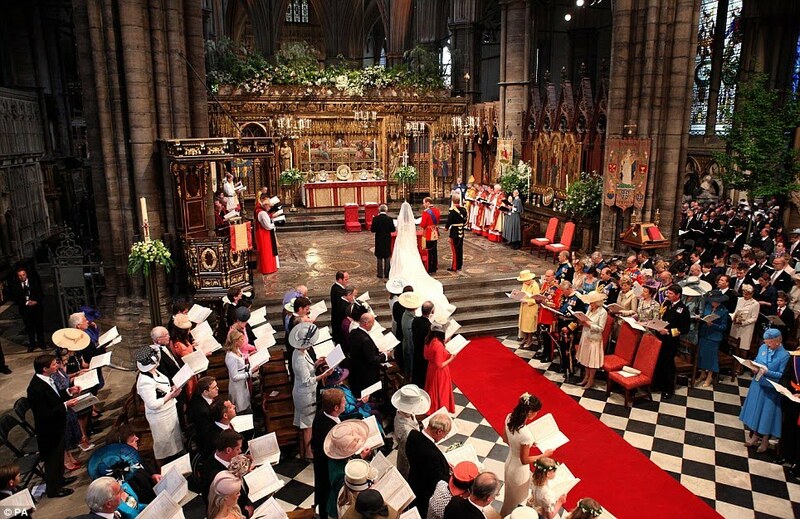 The bride and groom were joined by Charles and Camilla, Michael and Carole Middleton, best man Harry and Kate's brother James and sister Pippa in the tiny enclosed Chapel of St Edward the Confessor behind the altar. 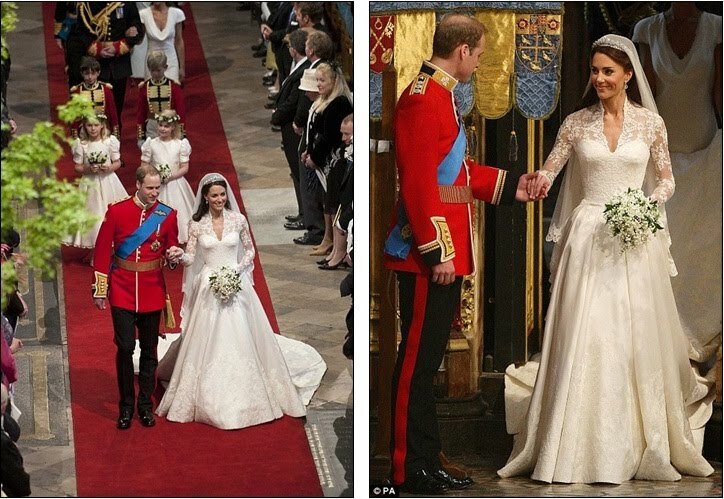 After a few minutes the newlyweds were left on their own for a period with just Harry and Pippa. When they emerged, the couple approached the Queen and paused to pay their respects to the monarch. 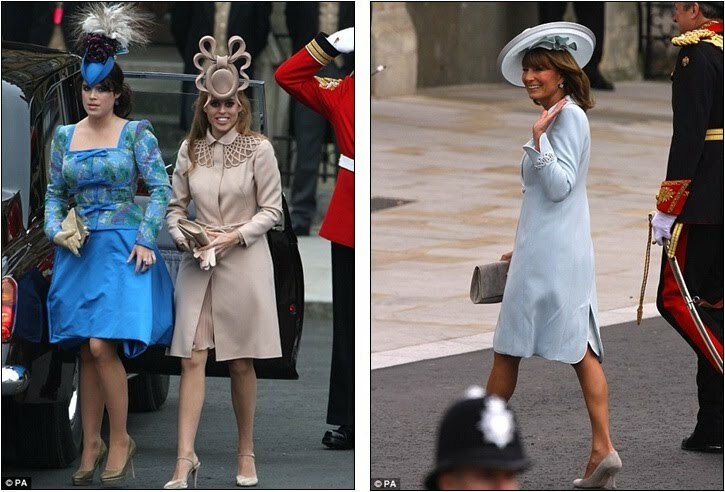 Kate gave a low curtsy - the first time she has formally acknowledged the sovereign in public - while William nodded to his grandmother. 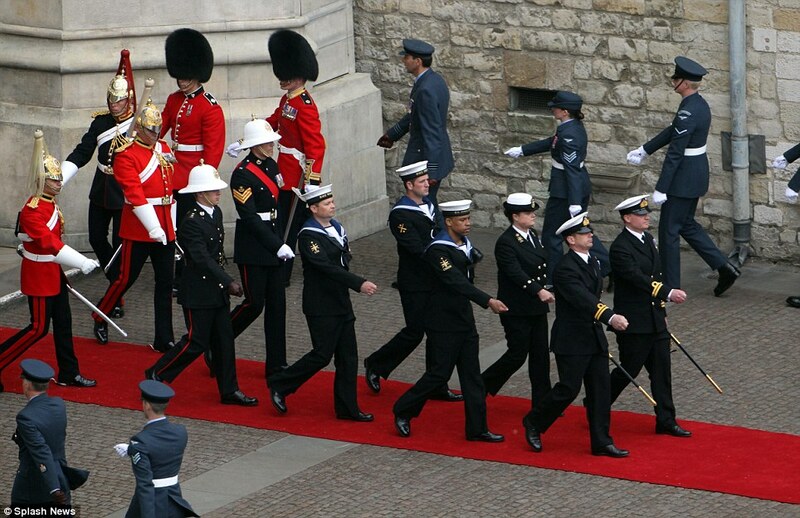 A special fanfare entitled Valiant And Brave - after the motto of the Prince's RAF Search and Rescue No 22 Squadron - was played. The 30-second newly commissioned celebration was sounded by seven trumpeters and one drummer from the Central Band of the RAF. 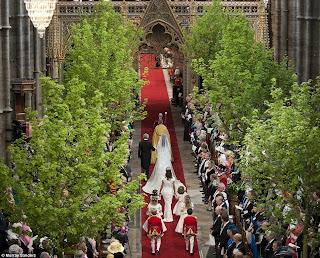 The bride and groom then processed down the nave with Harry and Pippa behind them arm in arm, moving on to the adoring crowds outside.